Our office is open to the public from 8:00 AM until 5:00 PM, Monday through Friday. We are located in the courthouse annex building. The goal of the Pike County Assessors Office is to provide the people of Pike County with a web site that is easy to use. You can search our site for a wealth of information on any property in Pike County. The information contained herein reflects the values established in the "most current published" tax digest. *Please note that the Assessors Office establishes values only. The Pike County Tax Commissioner should be contacted with tax bill related questions. 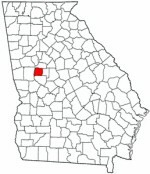 Pike County was created from part of Monroe County in 1822. 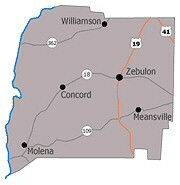 Georgia's 57th county and its county seat, Zebulon, were named for Zebulon Montgomery Pike. An expedition led by Pike in 1805 attempted (and failed) to trace the Mississippi River to its source. He discovered Pike's Peak on the same expedition. 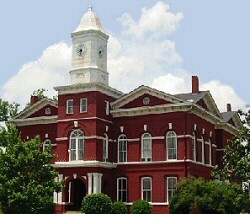 The Pike County Courthouse, built in 1895, is listed on the National Register of Historic Places. Agriculture and forestry are still the main industries in Pike County, though the county is feeling the effects of Atlanta's growth. The county is one of Georgia's major peach producers. Pike County has been the site for the filming of several motion pictures, including Murder In Coweta County, Cold Sassy Tree, and Tank.